USB Extension cables, also known as USB extension leads, provide connection from computers to peripherals, and are similar to standard USB cables. However the primary functionality for USB extension cables is to extend the functionality of a USB port which cannot be easily reached. The majority of USB extension cables go from a male USB connector to a female USB connector. 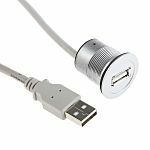 Where are USB extension cables used? They can prevent needing to access the back of a desktop computer. By adding a USB extension cable you will have easier access to USB ports at the front of the unit. Alternatively if you have a peripheral such as a printer, of which the cable is too short to reach the USB port, you can add the extension cable. With the extension cable, you do not have to locate the printer within close proximity to the computer. How long are USB extension leads? 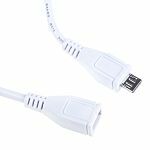 USB extension leads are available in various lengths to suit a range of applications. They can vary from around 0.5m to 15m. Note: Some USB connectors are available in both male and female (plug or socket) versions. IP ratings describe how waterproof the cable is. If you are looking for a cable which is water resistant, around IP40 is suitable. If you require something which is waterproof, you should look at a higher number such as IP67 or IP68.